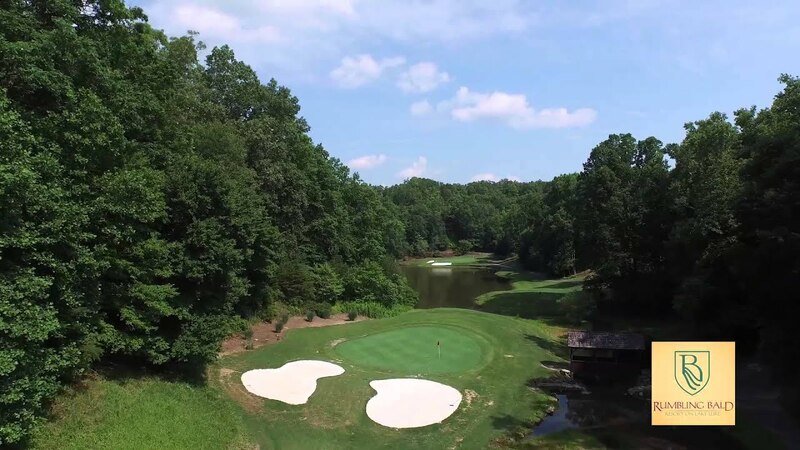 Carved into the surrounding Blue Ridge mountains, our two championship golf courses weave themselves through the Resort property offering golfers of all ages and abilities the opportunity to hone their skills. Our courses, each with a Golf Digest 4-star rating, are specifically manicured for world-class play and provide year-round opportunities for golfers to enjoy play among the breathtaking mountain and lake views. 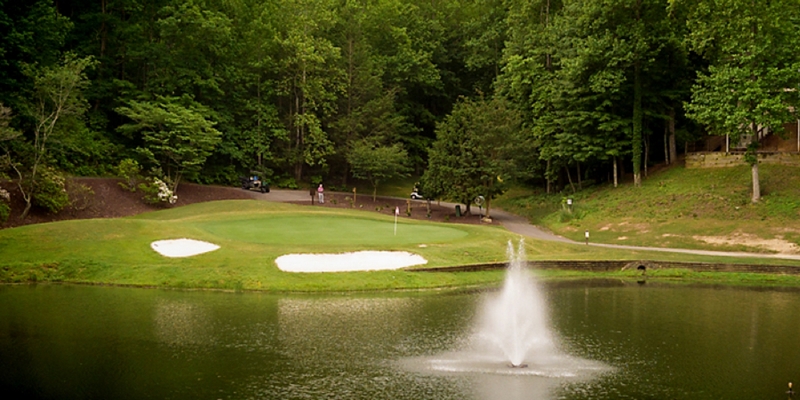 Bald Mountain Golf Course, designed by William B. Lewis and built in 1968, was the first created at Rumbling Bald. This challenging course is complemented by gorgeous mountain views and the towering rock faced cliffs it was named for. With its well guarded greens and tight fairways, golfers must be precise with their drives and approach shots. A popular course for all ages and abilities, Bald Mountain receives high marks from Golf Digest readers. The course has four sets of tees and measures 6,283 yards, has a course rating of 70.9 and a slope rating of 128. One of the highlights during your round is the par 3 16th hole. Scenes from the hit movie "Dirty Dancing" where filmed here. 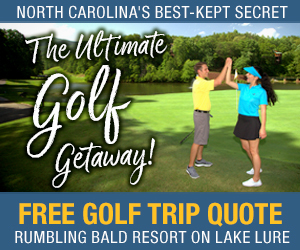 To book tee times, please call the Bald Mountain Golf Shop at 828.694.3042 or 800.419.3854. Free Golf Quote! Let us know how we can help build the perfect Golf Getaway with a Free Golf quote. It is an exciting time here at Rumbling Bald Resort as we are now offering affordable memberships focused on golf. We have some great opportunities for you to take advantage, and we look forward to seeing this grow into a successful program. Our two golf courses, Bald Mountain and Apple Valley, are so much fun to play and are always in great condition. It is a rare treat to have two golf courses and there are not many places around that can boast such a thing. The membership drive is only for a limited time! No initiation fee for any of our membership categories. Golf Membership allows you to participate in all RBR events such as the Club Championship, Member-Guest, Ryder Cup, Solheim Cup, Member-Member and many more! Golf Members will also receive special additional discounts throughout the season, but always receiving 20% off merchandise in either Pro Shop. Annual Range Plan - Unlimited Use! If you sponsor a new member during our membership drive you will receive $150 in golf shop credit. Please note: Non-Residents may acquire the Individual, Family or Weekday membership. The Seasonal Membership is only offered to residents of Rumbling Bald Resort. All membership categories, excluding the seasonal option, requires a 12 month promissory note to bypass an initiation fee. Group golf trips and tournaments can be a fun, team-building experience for retreats, conferences and fundraisers. Planning one, however, can be quite an endeavor. At Rumbling Bald, we take care of all the details so the only thing you need to worry about is your golf game. Your personal event coordinator will help you plan the entire trip including lodging, golf and any special needs your group may have. 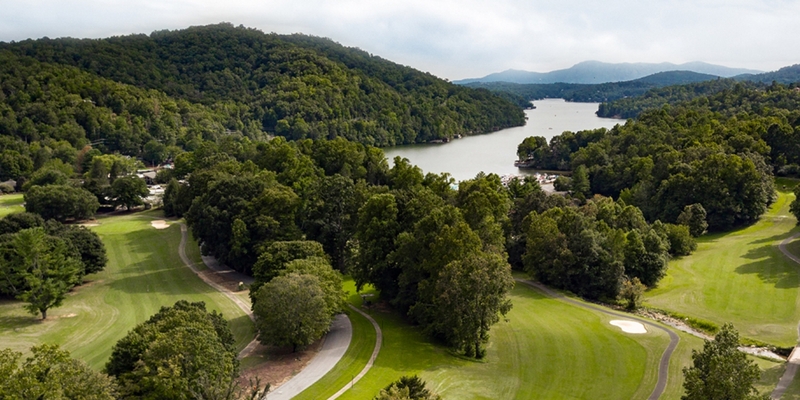 Groups return year after year to experience golf in the Lake Lure area. To make arrangements for your group or to design a custom group package please contact Group Sales at 828.694.3000 or via email at GroupSales@rumblingbald.com. Your Perfect Mountain Wedding Destination. We know your wedding is more than just a ceremony and Rumbling Bald Resort is the perfect place to create the magical wedding of your dreams. In a magnificent mountain setting, your friends and family can share and celebrate this very special occasion. No matter the season, Rumbling Bald can create the unforgettable moments a destination wedding can provide for you and your guests. We cater to your needs and can build custom packages for your vacation or outing. Contact GroupSales@rumblingbald.com for more information or call 828.694.3050. Golf Groups of 16 or more contact GroupSales@rumblingbald.com for your FREE golf quote. We offer 4 unique dining options at the Resort. Watch the Bald Mountain Video Course Overview Video. This profile was last updated on 06/12/2018 and has been viewed 10,268 times.